Buy Training – Save $50! The Fastest Growing Field in Pharmacy - International travel is large and growing. 80 million people per year travel internationally and nearly 50% get sick from a preventable illness - yet a tiny fraction of travelers get proper medical advice. The local pharmacist is in the best position to inform, educate and treat a traveler. What's Missing? Pharmacists are smart and have access to travel specific medications and vaccines yet without proper training and a program - it's difficult for the pharmacist to offer expert travel health services. TravelCare offers training and software that allows the pharmacist to offer Expert Travel Health Services. See the demo. The Benefits - There are two great benefits of offering Travel Health Services. First, each international traveler is worth $400 in incremental revenue to your pharmacy! Routine and Travel Vaccines, Prescriptions Drugs, Over the Counter Drugs, and in-store purchases add up when traveling overseas. We can show you how this works. Second, offering expert travel health services provides a "value-added" service to bring in new customers and retain the customers you have. Get Ahead of the Curve - Transitioning from flu shots to routine and travel vaccines is not that difficult when the pharmacist and assistants are properly trained and have systems for delivering expert information. TravelCare offers a combined software and Certification training program specifically for pharmacists. Our Software Platform - TravelCare is an out of the box solution for pharmacists. Our web-based program provides everything you need to generate expert reports for any destination in the world. 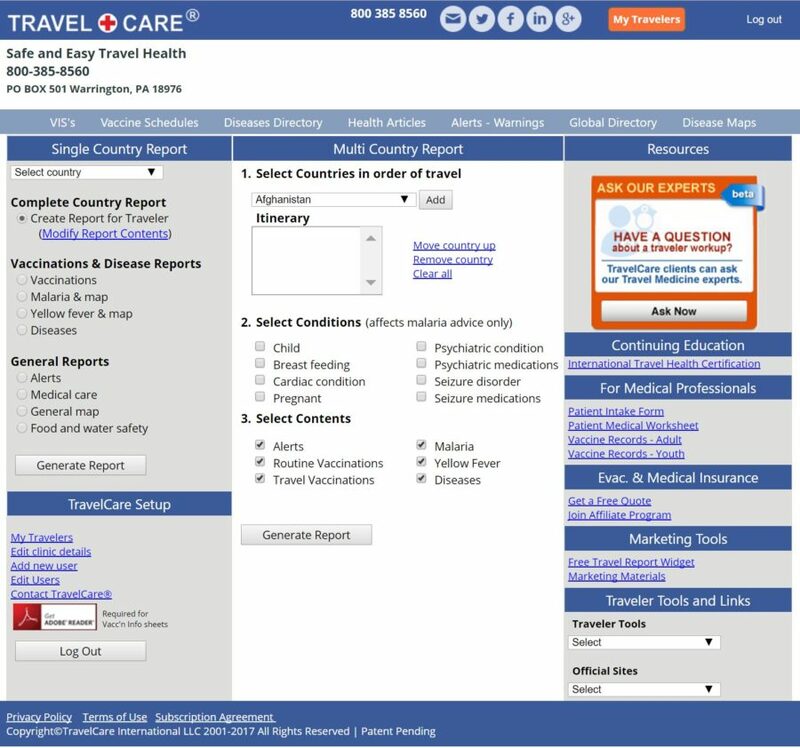 Reports are customizable and include disease, endemic illnesses, prevention and recommendations for routine and travel vaccines, prescriptions and over the counter medications. TravelCare provides everything you need to offer travel medicine services. See the demo. What's included in the Travel Medicine Platform? Our web-based software allows for users to login from any web browser and generate on demand medical travel reports for any destination worldwide. Our reports include comprehensive medical recommendations, safety and security information on over 260 destinations. We offer single and multi-country itinerary reports and each report can be customized to your needs. A comprehensive suite of resources for vaccines, disease, prevention, world maps, etc. is included. There is no product on the market today that provides better and more current travel medicine data exclusively for Pharmacists.